If you haven’t been to The Home Depot in a while, it’s time you paid a visit. You’ll find craftsman-quality, North American-made veneer core hardwood plywood suitable for cabinetry, built-ins, furniture and more. Better yet, it’s made with EPA award-winning PureBond® technology, so you and your customers can be confident that it was made with no added urea formaldehyde. These panels are all CARB P2 compliant and contribute points to LEED® and other green building standards. PureBond® formaldehyde free assembly technology. Panels are high-quality, patch-free domestic ANSI face grades. Most popular species: Birch, Red Oak or Maple. Perfect for cabinets, furniture, wall paneling, shelving, storage solutions, media centers, built-ins, headboards and more. Light weight, all-wood veneer construction preferred over composite panel products like particleboard and MDF. Hardwood Face and Back Veneer. For other species or core types, see the Home Depot Associates at the ProDesk for details. When the warmth, beauty and timeless quality of hardwood is required in cabinets, furniture, wall paneling, shelving, storage solutions, media centers, built-ins, headboards and more. In most stores you’ll find Red Oak and Birch plywood in stock and ready to use. Standard sheets are 4’ x 8’ and come in 1/4″, 1/2″ or 3/4″ thicknesses. Perfect for DIY or small project shops. 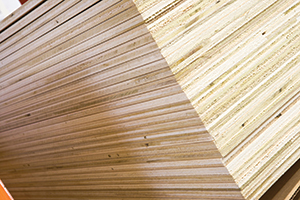 All panels are grade C-3 which allows for small openings in the core and knots in the veneer. Save time in the shop. We can provide pre-cut panels to your specifications. Whether you need cabinet box parts, drawersides or other specific components, they will be precut and shipped ready to use. 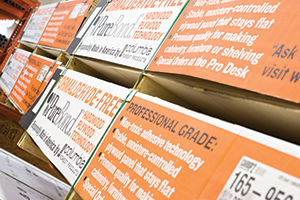 You can also specify components to be pre-finished with our VOC-free, durable clear topcoat or even already edgebanded. Looking for some samples or more information on our PureBond hardwood plywood products? Click here.